Technology is slowly taking over the world of business. Everything from data entry and in-office communication to advertisement and conducting transactions can be done using a computer. 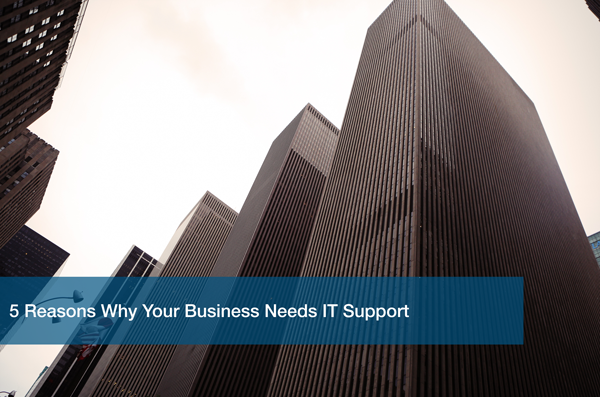 For this reason, whether you are running a multinational corporation or a small family business, there is no denying the importance of having a good IT support strategy. Not only is having a solid IT strategy important, but in a recent blog post we mentioned 10 ways to leverage technology to improve your business. The problem with technology is that it is new to most people and challenges are therefore inevitable. Below are five common IT challenges that necessitate IT support services especially for small businesses. This is one of the main reasons why your business needs professional IT support. IT systems combine up to date technology with appropriate information from your business for easier communication and overall more efficient running of the business. Setting up this system is not as easy as plugging in a couple of wires here and there and saying voila. It is a delicate process that needs to be done by professionals to ensure that it is set up right for the sake of your business. So if your business doesn’t already have an IT strategy, you might need to consider finding an IT partner as soon as possible to ensure that you can compete on a fair field with other businesses. The second challenge is that of diagnosing and fixing problems with your systems and networks. System crashes are unfortunately a common occurrence especially when they are overloaded. For a business that has become dependent on their IT system, failures can be absolutely crippling. IT support companies help by identifying and solving the problem quick enough for you to go back to the normal business routine without incurring any major losses. IT systems need to be constantly monitored and managed. This is done to ensure that they are always running smoothly and efficiently for the benefit of your business. Regular system and network maintenance is a challenge especially if there are no tech savvy members of your staff. This is where IT support companies come in to offer you the much needed expertise to ensure that your IT systems are properly and regularly maintained. Technology is very dynamic and is an ever changing field. Keeping up with what is new is yet another IT challenge that small businesses face. Having an IT support partner ensures that your systems are kept up to date so that you are not left behind using obsolete and outdated equipment while your competitors move ahead. IT support is also very important in that it helps solve the challenge of information security for your small business. This refers to keeping your sensitive data and information safe from unauthorized people who might have malicious intentions. Security is also offered in terms of protecting your work from damage by malware. There are many different tools including firewalls, encryption and bio-metric protection systems to keep your computers, network, and business safe. The challenges above are just a few that come with adopting IT systems. It is therefore important to ensure that as a small business owner, you get yourself the best IT support available. This way, you will get the best technology has to offer your business with a whole lot less stress.